CHASE SKIN CARE organized a Complete Beauty and wellness seminar at Narayana Vihar, Delhi recently which aimed at not only spreading awareness on holistic treatment but also the right usage of aromatherapy for to be brides. 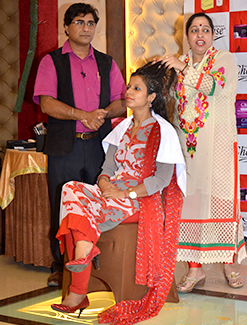 The workshop was inaugurated by Dr. Naresh Arora, Cosmetologist and aroma therapist from Chase Skin Care Institute. “To offer holistic treatments and a blend of unique therapies, the seminar introduced traditional Indian and contemporary solutions through holistic healing. The Seminar also focused on the use of alternative treatments such as siddha, yoga, naturopathy, nadi chikitsa, kalari chikitsa, aromatherapy, Reiki and beauty care.” Informed, Dr. Naresh Arora. Around 300 delegates from the field of beauty and health joined Dr. Naresh Arora in his endeavor and shared their knowledge with participants and audience in the seminar which was held in ,CHASE aroma & skin care clinic, Narayana Vihar. Renowned naturopath and reiki expert Dr. Neeti also took active participation in the workshop and Aestheticians, Hair Style Experts and dieticians gathered from Delhi and Mumbai and held exclusive sessions on skin and hair care regimen and gave consultation to students of Chase Institute and patients. There were live demonstrations of trendiest and stylish coiffure and makeup for changing season. The programme threw light on the need and aspects for self-grooming and personality development. Dr Niti, renowned naturopath, yoga & reiki expert also participated in the seminar and held sessions on how reiki and aromatherapy can complement each other in creating wonders on body, mind & soul ‘We want to touch upon one of the most important and unspoken area in holistic healing about aromatherapy and reiki complementing each other and then getting the optimum result. An elixir of life aroma and reiki clubbed together can alleviate, relax and uplift even the most tired body and stressed mind” informed Dr Neeti.